March is the month of spring and has always been one of fond memories for me. My best friend from preschool years and my favourite auntie have their birthdays on the official first day of spring - the 21st of March which is usually the spring or vernal equinox. Happy birthday to you! The month of course is named after the Roman god of war, Mars which brings the imagery of a chariot blazing across the sky dragging spring behind it. It would be nice to think that the verb to march would fit in here, (one imagines legions of Roman soldiers in strict formation) but sadly it doesn't. So what other phrases and idioms are connected with March? Mad as a March hare, meaning completely crazy, stems from the dancing/jumping/boxing motions of hares at this time of year - it is their mating season. Just have a look at this! Finally, March comes in like a lion and goes out like a lamb, refers to the changeable weather and the change of the season. Early March weather tends to be fierce and cold whereas in late March one can really feel the mildness of spring just around the corner. 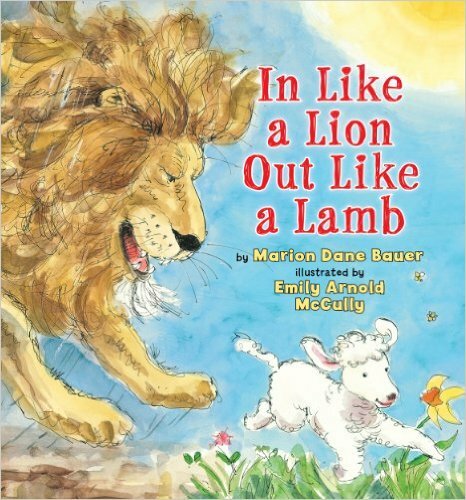 Lions are fierce, lambs are mild, it's not so hard to see! There is a lovely children's book of the same name written by Marion Dane Bauer and illustrated by Emily Arnold McCully that brings this idea to life provides plenty of weather vocabulary too.